University of Wisconsin senior golfer Jordan Hahn likely wasn’t complaining about the rain Sunday in West Lafayette, Indiana. With the final round of the Boilermaker Invitational canceled due to rain, Hahn was declared the winner by virtue of his 36-hole lead. He posted a 67-68 for a 9-under-par 135 on Saturday, two shots ahead of Oklahoma’s Riley Casey. 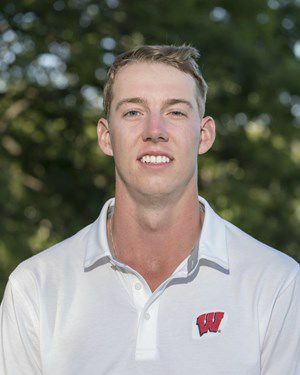 It’s Hahn’s third title and the first solo-medalist victory by any UW player since Dan Woltman won the VCU/Mattapoini Springs Shootout in 2006. It was Hahn’s fourth top-10 finish this season and 11th of his career. The Badgers finished tied for seventh place with an even-par 576 in the 15-team field, 16 strokes behind winner Illinois State. Sophomore Jesper Freimuth and freshman Jared Pratt recorded singles victories in straight sets, but UW (9-10, 3-5 Big Ten Conference) fell 5-2 to host Michigan (15-6, 6-3) in Ann Arbor. Pratt teamed with senior Osgar O’Hoisin for the team’s lone doubles win. UW concludes the regular season next weekend with home matches against Northwestern and Illinois. UW (15-4, 7-2 Big Ten) beat Northwestern (11-9, 5-4) for the first time since 1998, with sophomore MaryAnn Rompf’s three-set singles victory securing the 4-3 win at Nielsen Tennis Stadium. Sophomore Anna Makarova and freshman Ava Markham also triumphed in singles. The doubles point came from the teams of Makarova-Lexi Keberle and Markham-Rompf.